To begin with, everybody who knows the Frank Capra movie (and who doesn’t, if they are drawn to attend this opera) brings a lot of baggage to the party. Will George Bailey sing “Buffalo Gals?” Will there be a “Hee Haw” aria? Will the opera be too cute and sentimental? Will it be cute and sentimental enough? Frankly, I am agog with admiration just imagining where composer Jake Heggie and librettist Gene Scheer found the courage to take on this chestnut. But take it on they have, with considerable success. The happy sentiments are delivered, the story is intact, and the small town of Bedford Falls is a recognizable place where we can feel at home. Heggie’s music offers everything we expect of him. It is accessible but sophisticated. Again and again he references various familiar idioms, but only for a moment, slipping in and out of Americana like a Vaudeville quick change artist. The music is challenging (perhaps more for the singers than the audience) but never in-your-face about it. The orchestration for 50 musicians is modest and effective. The through-composed score never seems to falter or bore. Unlike the film, the opera opens in the heavens, where Clara (not Clarence), an Angel Second Class is disturbed by prayers she hears rising from the town of Bedford Falls, seeking help for George Bailey. 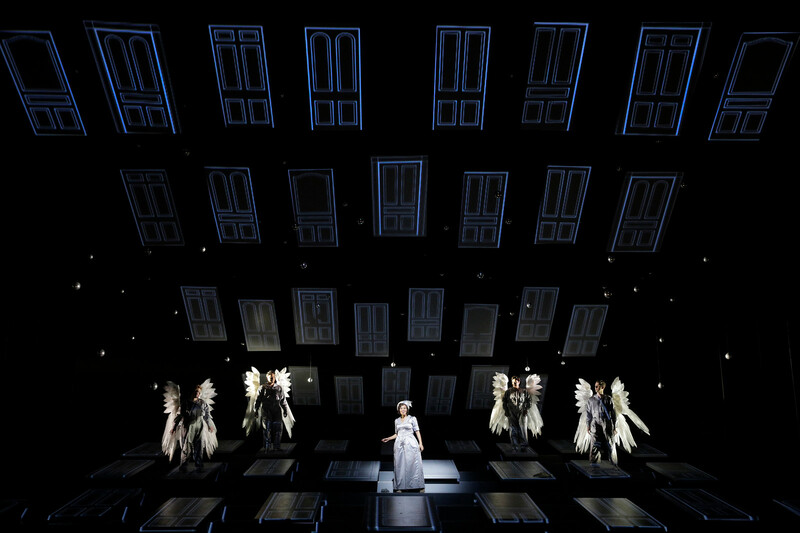 She pleads with a mysterious celestial voice (pre-recorded by, of all people, Patti LuPone) for the chance to help Bailey, and, perhaps, earn her wings to become an Angel First Class. Her wish is granted, but before she can intervene, she must learn all of Bailey’s life up to the present crisis. Descending to earth, she becomes an unseen watcher of Bailey’s adventures, from his childhood rescue of his younger brother fallen through the ice, to his father’s death which keeps him from leaving town for college, to the run on the bank during the depression, right up to his current suicidal crisis. Making her SF debut as Clara, soprano Golda Schultz is a delightful singing actress, with a charismatic stage presence and a clear, ringing tone supported by a masterful technique. Schultz’s repertoir is remarkable, ranging from Musetta in “La Boheme,” to her attention-grabbing Metropolitan debut as Pamina in “The Magic Flute,” to the goddess Freia in “Das Rheingold.” This young singer is, already, a Diva First Class with Full Wings, and her performance alone makes “It’s A Wonderful Life” worth attending. There are other standouts, including tenor William Burden’s charmingly vulnerable George Bailey, a role he created for the world premiere. Quite thrilling is Canadian soprana Andriana Chuchman making her SF debut as Mary Hatch Bailey. Chuchman is an excellent actress, with a large emotional range and exceptional physical grace. She also possesses a bouyantly sparkling voice with which she seems to achieve her effects without visible effort. From an acting standpoint, especially, tenor Keith Jameson as Uncle Billy Bailey (yet another SF debut) is surprisingly touching. Musically, and for individual performances, this production is wonderfully satisfying. Yet, for all that, it is oddly distant in its emotional range, never quite achieving the warmth of the Capra movie that inspires it. Perhaps the interesting setting by Robert Brill, with its metaphorical doors in the sky and minimalist approach, is too abstract for small town America. I found myself longing for a full, realistic, traditional set that would transport me to a small American town during an evening snow fall, like the one I remember from the movie. Still, families will enjoy this Christmas spectacle (although young listeners may find the score insufficiently melodic to hold their interest), and admirers of Jake Heggie’s music will not be disappointed. “It’s A Wonderful Life” plays at the War Memorial Opera House through December 9, 2018. For further information, click here. “It’s A Wonderful Life,” an opera in two acts by Jake Heggie, libretto by Gene Scheer. Based on the 1946 Frank Capra movie of the same name and the short story “The Greatest Gift” by Philip Van Doren Stern. Conductor: Patrick Summers. Director: Leonard Foglia. Set Designer: Robert Brill. Costume Designer: David C. Woolard. Lighting Designer: Brian Nason. Projection Designer: Elaine J. McCarthy. Choreographer: Keturah Stickann. Chorus Director: Ian Robertson. Dance Master: Lawrence Pech. Clara: Golda Schultz (Kearstin Piper Brown on 12/9). A Voice (pre-recorded): Patti LuPone. Angels First Class: Sarah Cambidge, Ashley Dixon, Amitai Pati, Christian Pursell. George Bailey: William Burden. Young Sam: Joshua Partlow. Young George: Benjamin Drever. Young Mary: Violet Pasmooij. Young Harry: Pablo Gracia. Harry Bailey: Joshua Hopkins. Uncle Billy Bailey: Keith Jameson. Mother Bailey: Catherine Cook. Mary’s Suitor: Andrew Truett. Mary Hatch: Andriana Chuchman. Mr. Potter: Rod Gilfry. Ernie: William O’Neill. Sam Wainwright: Anders Frölich. Randall: Colby Roberts. Mrs. Thompson: Buffy Baggott. Woman: Claire Kelm.Man: Jere Torkelsen. Mr. Delgado: Michael Belle. Mrs. Delgado: Erin Neff. Tommy: Pablo Gracia. Janie: Violet Pasmooij. Zuzu: Cadence Goblirsch. Mr. Rufino: Phillip Pickens. Mr. Martini: Chester Pidduck. Mrs. OMalley: Jesslyn Thomas. 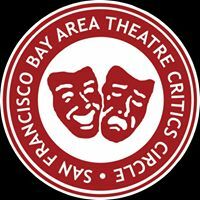 Posted in Reviews.Tagged Andriana Chuchman, Charles Kruger, Gene Scheer, Golda Schultz, It's A Wonderful Life, Jake Heggie, Keith Jameson, Robert Bril, SF Opera, theatrestorm, William Burden.